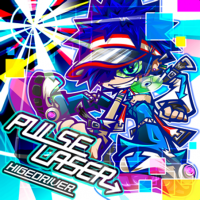 A long version of PULSE LASER appears on Hige Driver's 14th album, ヒゲドライバー 10th ANNIVERSARY BEST. 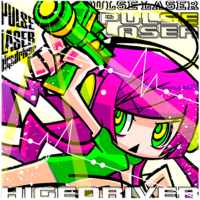 PULSE LASER marks Hige Driver's debut in BEMANI. PULSE LASER received a new EXHAUST jacket on August 3rd, 2012. This new jacket, designed by Litbi, was one of the winners of the Jacket hokan MISSION ichi-FIRST-MISSION (ジャケット補完MISSION 壱-FIRST-MISSION) contest. Before this update, PULSE LASER's EXHAUST chart used the same jacket as its NOVICE chart. PULSE LASER's artist appears romanized on the SOUND VOLTEX NOVICE and EXHAUST jackets. PULSE LASER is one of the bistro saucer 8th Set unlocks of jubeat saucer. It could be unlocked from July 1st to 31st, 2013. It was removed on November 1st, 2013. It was revived on February 1st, 2014. In jubeat Qubell, it is one of the Emerald STAGE 11 unlocks of jubeat Qubell's dig dig Qubell unlocking system. PULSE LASER's SOUND VOLTEX NOVICE jacket is used as the jubeat series' jacket. PULSE LASER received an INFINITE chart in SOUND VOLTEX II -infinite infection- on November 8th, 2013. It is available for purchase after obtaining a AA rank or better on HAPPY HEART BEAT's EXHAUST chart, or by playing it ten times. 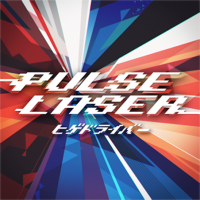 PULSE LASER is one of the songs featured on the BEMANI SONGS ～Best of SOUND VOLTEX～ video. PULSE LASER's BPM is incorrectly displayed as 180 in the jubeat series.